WALMART FUTURISTIC TRUCK! Lightweight & Environmentally Friendly! Spaceship & Truck Combination! - Muscle Cars Zone! WALMART FUTURISTIC TRUCK! Lightweight & Environmentally Friendly! Spaceship & Truck Combination! The Walmart Futuristic Truck is here -- one of the best things you have ever seen. Great creation! Well you certainly do not go to Walmart for a futuristic eco-friendly truck, do you? Well maybe you should, or at least try to look at it! 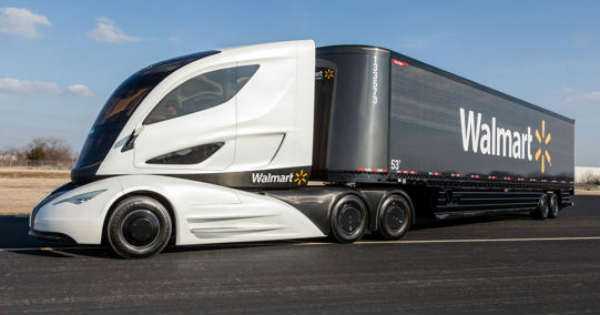 Walmart, however did their homework as they created this WALMART FUTURISTIC TRUCK which is amazing and is very good for the environment! We are deeply entered in an era when we have to think in a “greener” way if we want to preserve the health of our planet Earth as much as possible. The fact that we see growth of the people`s awareness related to the greenhouse gasses issue makes us eminently happy. It also makes us even more satisfied when people are trying to do something in order to keep the planet green besides just being aware of that. WALMART FUTURISTIC TRUCK! Lightweight And Environmentally Friendly! Spaceship and Truck Combination! Today`s video is sort of related to this issue and you are going to see why. You have the chance to see a relatively new truck design that takes care of our planet. It is owned by the well-known retail corporation WALMART. So what is so special about this Walmart futuristic truck? Well, starting from the outside, this truck called WAVE, looks very twenty-first-century. It is like a combination of a space ship and a racing vehicle. Moreover, the driving cabin looks like a cockpit from a futuristic airplane. The fortunate driver will be seating in the middle of it, unlike the conventional cabins, and sleeping space is right behind the driver`s seat. And here comes the main part. The whole truck with the trailer itself is built from a light carbon fiber material. This is what makes WAVE more fleet efficient. What do you think of this truck? Feel free to give us your opinion! Plus, if you want to read more about the company`s truck fleet, follow this link.